Toxic doses of biohazard materials have strange effects on the living and the dead. Consider any of these Biohazard Mutant Body Parts Tattoos, which can be used to apply mutated details to any good radioactive zombie costume. 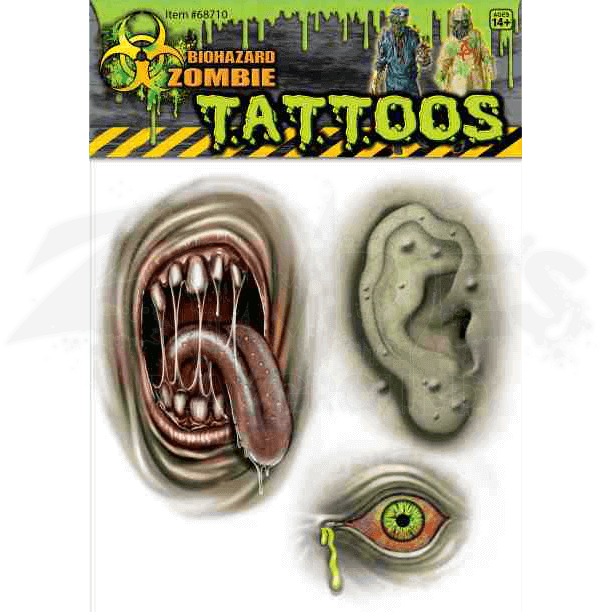 Each pack of tattoos contains three different decals, which can be used to apply a variety of disturbing new mutations to any zombie or radioactive mutant look. The first tattoo depicts a new mouth, opened wide with gapped teeth and a flailing tongue, all while hungrily dripping saliva. The second tattoo is a wart-covered ear that could have grown on a zombies arm, cheek, or anywhere else. And the last tattoo is a third eye with striking, acidic green color that drips toxic green ooze from the corner. All of these Biohazard Mutant Body Parts Tattoos are easy to apply and easy to remove, all while allowing any zombie to add a few new and eerie details to their contaminated and radioactive form.